Stop us if you’ve heard this one before: “A butcher walks into a cocktail bar.… ” So goes the tale of the carnivorous restaurant group Cannibal opening a cocktail bar right next door to its beer-sloshed midtown gastropub. And though the Cannibal Liquor House shares a name (and space) with that pub, the two are hardly alike. 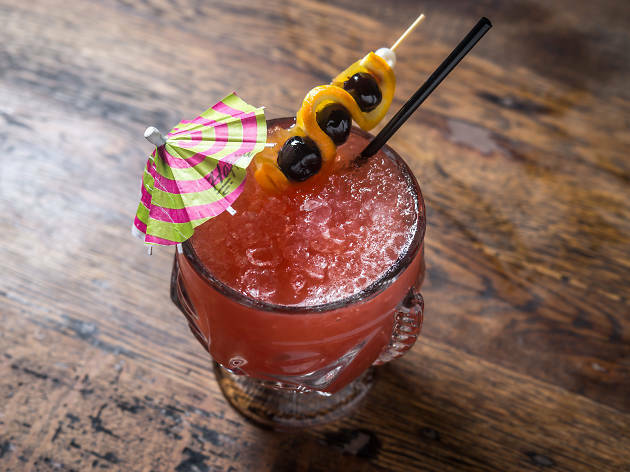 While Christian Pappanicholas’s flagship huffs a rugged air with a meatcentric menu, its Liquor House sibling doles out cocktails that are sometimes fruity and downright pretty. The Cannibal’s rustic dark-wood aesthetic and beer fridges have been traded for mint-green walls and potted plants, but that doesn’t mean the staff is less laid-back and friendly than the Cannibal crew. 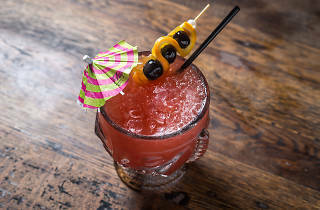 ORDER THIS: Don’t let the playful cocktail list fool you; these drinks are strong. Even syrupy-sweet ones—like a rum-laced Cranberry Cooler with citrus ($14) or a Creamsicle-flavored Harvey Wallbanger updated with house-made orange marmalade ($14)—are sure to kick-start your buzz. If you’re into darker liquors, the rich bourbon and bitter lemon in the Passing Notes gets a sweet lift from maraschino cherry ($14). GOOD FOR: A fresh update to your typical Kips Bay bar date. The approachable menu and abundance of tables won’t have you scrambling for a seat or scratching your head at the drink list, and the servers are more than willing to offer guidance based on your tastes. But prepare for the thumpin’ rock-and-funk playlist, the volume of which might make getting to know your date difficult. But hey, it beats yelling over the blaring football game in the sports bar down the block. THE CLINCHER: The Liquor House acts as a bit of a catchall due to its large, welcoming space and versatile menu. You can bring your cocktail snob, beer aficionado and meat lover to drink and dine in harmony. For the latter, opt for the pricey but worth-it Mama’s Burger ($27), sandwiching provolone and harissa mayo between two buttery slabs of Texas toast, or crispy Reuben egg rolls ready to dip in IPA mustard ($12). Okay, so you definitely won’t lose any calories here, but you can stare at the cycling photos on the walls to pretend.